The typical American breakfast is a nutrition nightmare, zapping our energy and altering our appetite. 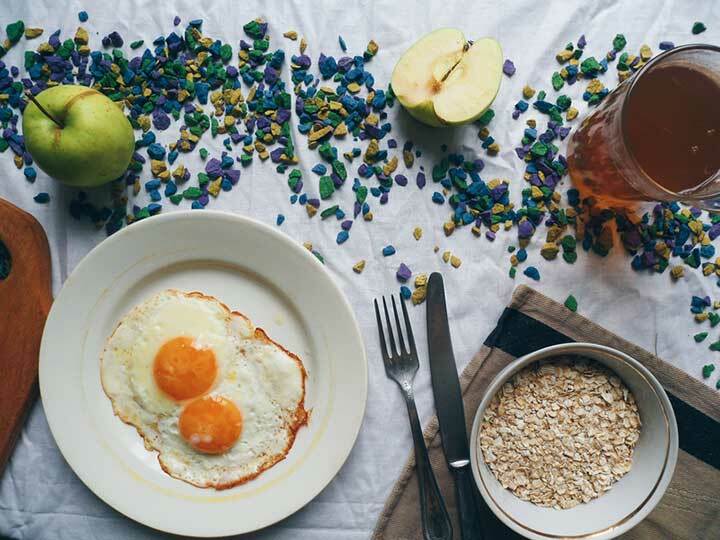 Use these healthy breakfast ideas for nutritious and delicious foods that will boost your energy level and help curb cravings. Healthy breakfast ideas? Eggs are often in play. The fats in whole eggs serve as a matrix to help the body absorb fat-soluble supplements such as vitamin E, fish oil, or CLA. Most people start the day with a breakfast full of sugar-laden foods that interfere with hormones and that lower energy levels. By mid-morning, you’re reaching for more caffeine or a sugary snack as a pick-me-up. That’s why it’s so important to have an arsenal of healthy breakfast ideas that will satisfy your hunger, keep you full, and provide your body with proper nutrition. The result? A hefty dose of sugar and carbs that combine to cause a major energy crash and an altered appetite throughout the day. Here are four healthy breakfast ideas that can provide a morning boost—prevent you from crashing. Many people have been taught that processed or pasteurized egg substitutes are healthy. But in reality, organic eggs are very nutritious as long as they’re properly prepared. Recommended: sunny-side-up or hard-boiled. When an egg is overcooked—as when it is scrambled—the cholesterol in it becomes oxidized; this oxidized cholesterol causes inflammation and can lead to numerous health problems. Additionally, the fats in whole eggs serve as a matrix to help the body absorb fat-soluble supplements such as vitamin E, fish oil, or CLA. In fact, it is highly recommended you take your healthy omega oils in the morning with your breakfast. Healthy breakfast ideas? You can’t go wrong with oatmeal flavored with a bit of cinnamon. Instead of eating cold cereal, grits, toast, or muffins, have a bowl of oatmeal. 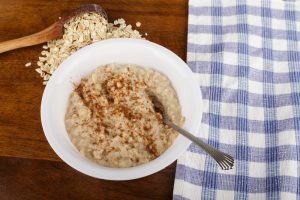 You hear of people lowering their cholesterol numbers just by eating a bowl of oatmeal each day—it’s the fiber content that makes that work. Fiber helps to flush out of your digestive track the bile salts and excess cholesterol the body does not need. Add ½ teaspoon of cinnamon to your oatmeal for more benefits. Harvard Medical School suggests that consuming as little as ½ teaspoon of cinnamon each day can reduce your blood sugar, cholesterol, and triglyceride levels by as much as 12 to 30 percent. 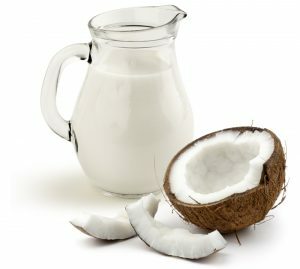 Replace the milk or cream you normally have with coconut milk. You also might consider replacing coffee with a healthier beverage such as green tea or pomegranate or vegetable juice. If you’re craving a sweet treat, try gluten-free pancakes and add a little “green” to your batter (see recipe below). Use organic maple syrup instead of the regular syrups on the grocery shelves. Maple syrup is very sweet like sugar but unlike sugar it contains several minerals and vitamins: calcium, copper, iron, magnesium, manganese, niacin, phosphorus, selenium, vitamin B6, zinc, and healthy linoleic fatty acids. However, if you suffer with blood sugar issues like diabetes, it is best to skip the maple syrup altogether. Grapefruit: Eating a grapefruit first thing in the morning can help boost your metabolism for the day. If you have other healthy breakfast ideas—especially “kid-friendly” recipes—share with us in the comments section below. Other readers who are wanting to improve the healthiness of their family’s breakfast menu without giving up flavor and satisfaction will be most appreciative! The digestive system has two main hormones that control hunger and appetite: leptin and ghrelin. Leptin tells the brain when the body is “full” and has had enough to eat. When you eat excessive carbohydrate-rich foods, especially sugars, high fructose corn syrup and refined (white) grains and bread, your body releases too much leptin into the blood stream. This overexposure inhibits the body’s ability to understand leptin’s messages, so the feeling of satiety is never achieved. Ghrelin is secreted by the stomach; its job is to increase appetite. When the stomach empties, it sends ghrelin out, requesting more food. Sugar and other sweeteners never shut off ghrelin, so a person is constantly receiving messages that the body is still hungry. Too much ghrelin and altered leptin signals is a terrible combination, especially if you want to lose weight! This often leads to obesity as well as diabetes. The release of leptin is also controlled by another hormone—insulin. Insulin is made by the pancreas and controls the level of the sugar glucose in the blood. Insulin permits cells to use glucose for energy; therefore, a person experiences an energy crash when insulin levels fluctuate. 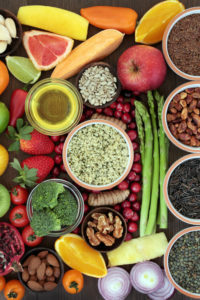 Sugars and carbs spike blood sugar levels quickly and cause a surge of insulin that plunges blood sugars too low, this in turn alters leptin levels and causes a person to feel hungry again. And as you grab for a mid-morning candy bar, the vicious cycle ensues. 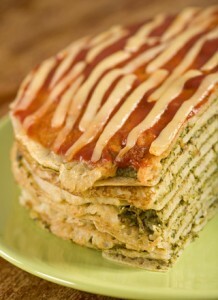 Combine eggs, spinach and bananas in blender or food processer. Pour this mixture into a bowl and add almond meal. Stir in the chopped pecans or almonds. Heat a few teaspoons of coconut oil in the frying pan and when hot, dollop the pancake mixture into the pain. Cook until bottom is brown; flip to the other side and cook until brown. Serve with organic maple syrup, organic butter and/or fruit topping. “Eat, Drink and Be Healthy: The Harvard Medical School Guide to Healthy Eating”; Walter Willett and P. J. Skerrett; 2005.
add, almonds, appetite, blood sugar, blood sugar levels, blood sugar symptoms, blood sugars, bone, bone health, brain, breakfast, caffeine, calcium, cholesterol, cholesterol numbers, chronic fatigue, coconut oil, coffee, corn, corn syrup, dairy, dangers, diabetes, digestive, feeling sleepy all the time, fiber, fish oil, food, ghrelin, glucose, gluten, gluten free, gluten free pancake recipe, gluten free pancakes, green tea, health, health problems, healthy breakfast, healthy breakfast ideas, healthy eating, high blood sugar, high fructose corn syrup, hormone, inflammation, insulin, insulin resistance, insulin resistance symptoms, iron, leptin, Lose Weight, lowering cholesterol, lowering cholesterol naturally, magnesium, metabolism, milk, natural sugar, natural sugar substitute stevia benefits bone health and more, niacin, nutrition, obesity, organic, osteoporosis, oxidized, oxidized cholesterol, pain, Pancreas, pomegranate, proper nutrition, protein, reactive hypoglycemia, recipe, selenium, skipping breakfast, sleepy all the time, spinach, stevia, sugar, sugar levels, supplements, triglyceride, triglyceride 2, triglyceride levels, vitamin, vitamin b6, vitamin e, vitamins, weight gain, whey protein smoothie recipes, whole wheat, why is breakfast important, yogurt, zinc. 6 oz container of high fiber vanilla yogurt (Dannon Oikos Triple Zero with stevia: no fat, no sugar and 6 grams of fiber). Although high in carbs, they are low glycemic carbs due to the high fiber content. This breakfast is very effective for weight loss and lowering triglycerides. for the rest of the day therefore I drink enough fluids all day long because of this. Other breakfast ideas: salmon and assorted vegetables, scrambled egg with mozzarella cheese and chicken bacon, after I have my hot water/T are usually have chunks of fresh pineapple, clementines, dark grapes, navel oranges, kiwi fruit, or cantaloupe. Fruit before a meal is wonderful. This is all very satisfying and gives us our electrolytes. I’ve noticed that whenever I have the healthiest gluten free organic pancake it does affect my weight and energy and I crave food later on. The only way I can get away with it is if I have a very small portion and it has an egg in it, protein powder in it, flaxseed or Chia seed, walnuts or almonds. This makes it more high protein. I hope this helps someone! ?